These Tipsy Cheese & Cherry Crostinis are a perfect summer appetizer! Made with fresh seasonal cherries and a flavourful Swiss like cheese. It’s Cheese of the Month time! 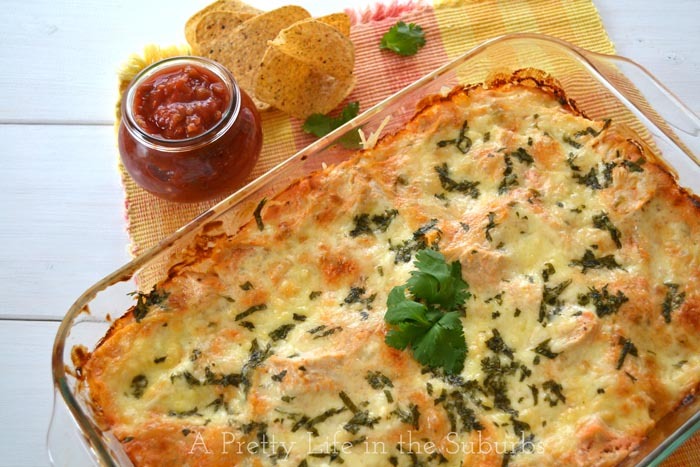 I hope you look forward to this cheesy goodness each month, as much as I do! I’m really enjoying discovering new Canadian cheeses. Canada has an amazing range of award-winning cheeses from different regions all across the country, so it’s exciting to be able find new ones and share them with you each month. Canadian cheese really is the best cheese. So far through this partnership with Dairy Farmers of Canada, I’ve had the chance to feature ‘Heidi’ in a Grilled Cheese with Fig Jam, ‘Dragon’s Breath Blue’ in a Dessert Cheese Plate and ‘Comfort Cream’ in a Baked Canadian Camembert with Rhubarb Compote. 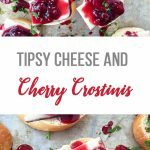 And this month I’m sharing Gunn’s Hill Tipsy Cheese in these Tispy Cheese and Cherry Crostinis! Dee. Licious. 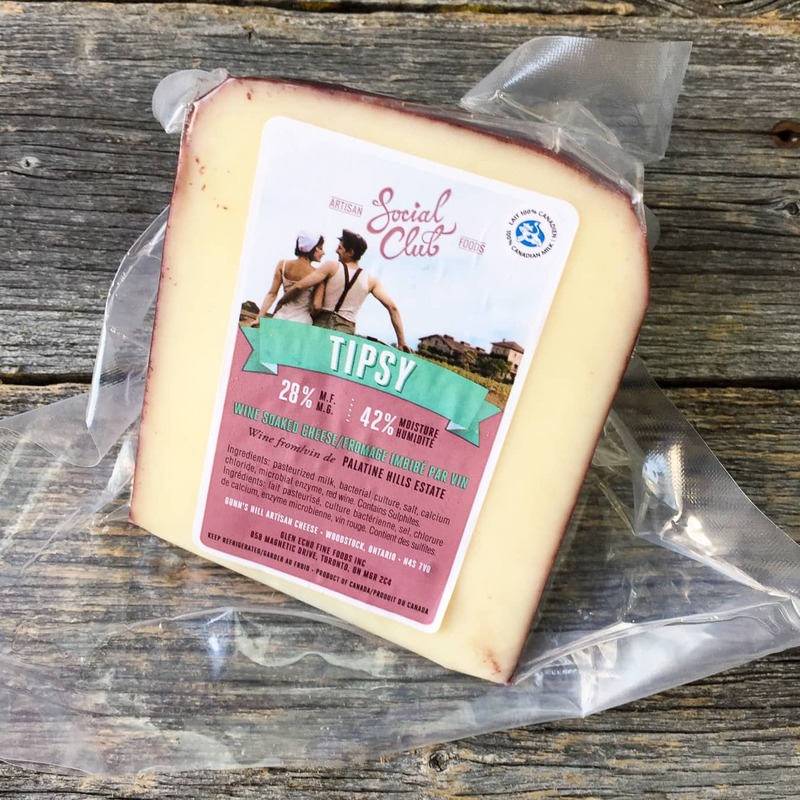 Tipsy comes from Gunn’s Hill Artisan Cheese out of Woodstock, Ontario. All of their cheeses are made with milk right from the family dairy farm. When I first tasted Tipsy Cheese I knew right away this was my favourite thus far. It’s a mild and creamy cheese with a subtle Merlot flavour. The Merlot flavour comes from the rind, as Tipsy has been soaked in Palatine Hills Cabernet Merlot for several days, so the rind is so good. So so good. Because I loved the flavours of the wine and cheese so much, I wanted to preserve them in a recipe. 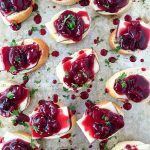 I wanted to make something that would bring out the true flavours of the cheese, so I decided to make these Tipsy Cheese and Cherry Crostinis. And they’re perfect for summer! 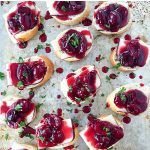 I kept things simple and made a cherry balsamic reduction to drizzle all over fresh bread and slices of the Tipsy cheese. And it works. Oh does it ever. You get rich and sweet cherry flavours, but you can still taste the creamy cheese with wine undertones. Tipsy is definitely on my list of favourite cheeses. I will be packing Tipsy on our next picnic, with crackers and bread…it’s a perfect picnic cheese. In a saucepan over low to medium heat, add the halved cherries, water/cornstarch mix, sugar and balsamic vinegar. Cook until the cherries are soft and the juices turn syrupy. Once the cherries are cooked, set them aside to cool. Slice the baguette into 1/2 inch slices. If you wish, you can toast the slices or leave them fresh, it’s entirely up to you! 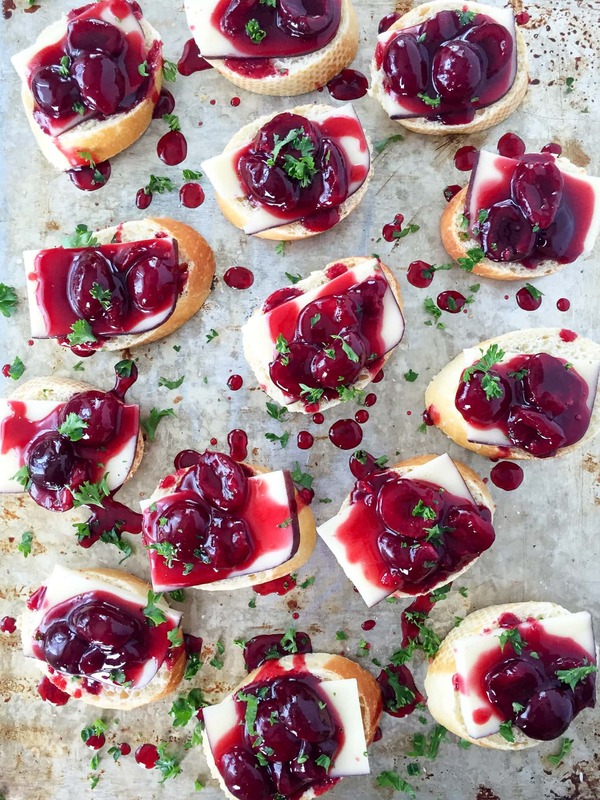 Lay the baguette slices out on a serving platter, add slices of the Tipsy Cheese, then add dollops of the cherry mixture to each crostini. Drizzle with extra cherry syrup, add salt & fresh ground pepper to taste, and garnish with fresh parsley. Type: Handcrafted washed rind cow’s milk cheese, modelled after a Swiss cheese. Soaked in Palatine Hills Cabernet Merlot. Tasting Notes: Mild creamy cheese with lactic and buttery flavours. With an edible rind rich in Merlot flavour. Pairs Well With: Lighter white wines like Riesling, as well as Lager beers. More Ways to Enjoy Cheese! I have been eating so many cherries lately! 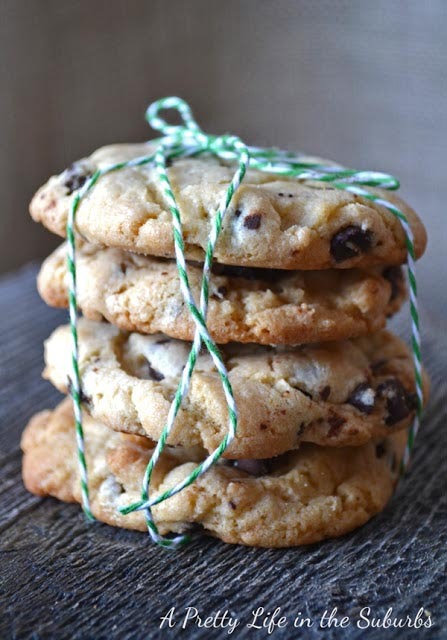 This is a delicious way to make them a bit more fancy and ready to serve to guests! I love how the colour of the compote you made matches perfectly with the rind of the Tipsy cheese! How picture perfect! Thank you Amanda! I loved the rind so much I wanted to try to keep it in tact for this recipe, and I’m super happy with how it turned out! I think this one was my fave of the program so far! Thank you so much Kacey! The rind was my favourite so I tried to keep it in tact for these crostinis! So yummy! This looks so good! I only ever eat cherries as they come, this is great way to use them! Thank you Sam! 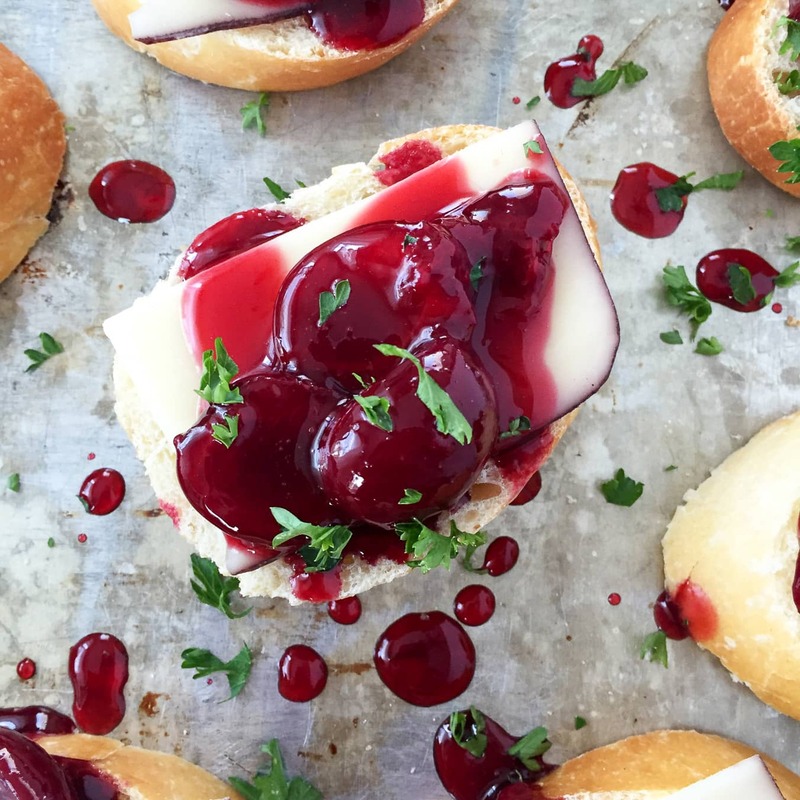 I bought a huge box of cherries this year which was perfect because we got our share of snacking in, plus I was able to try new recipes with them! Yummmmm! 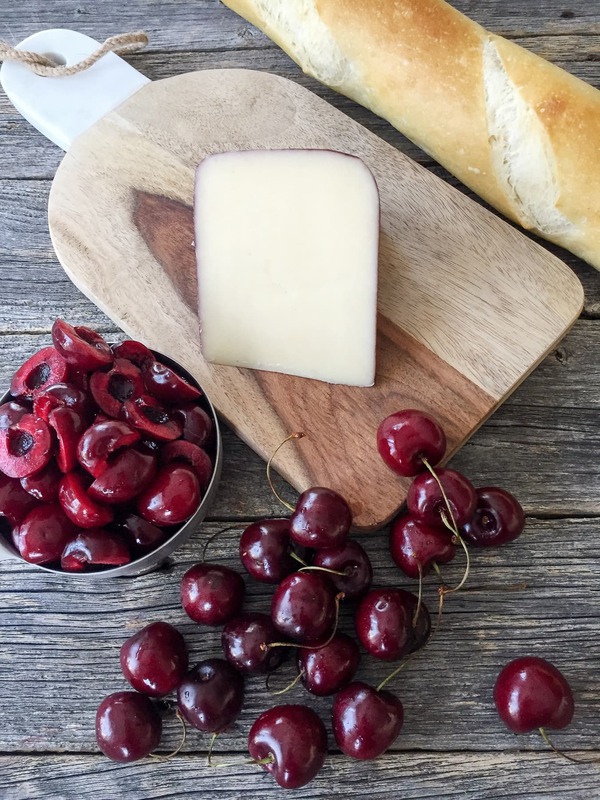 I just can’t get enough of this year’s crop of cherries… they’re so sweet and juicy right now, and oh so perfect for pairing with the soft creaminess of the cheese. Oh the cherries this year are amazing!! 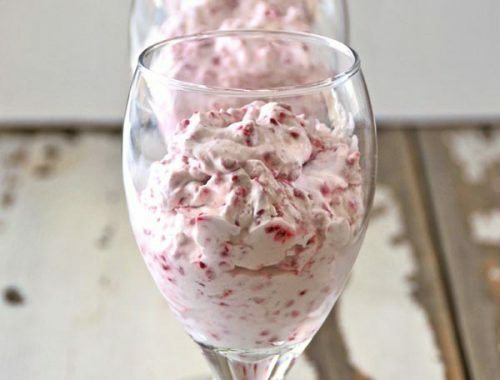 We’ve eaten SO many…and I’m having fun experimenting with cherry recipes too! I wish had more Tipsy cheese though…oh man, that is a good cheese! These look incredible. 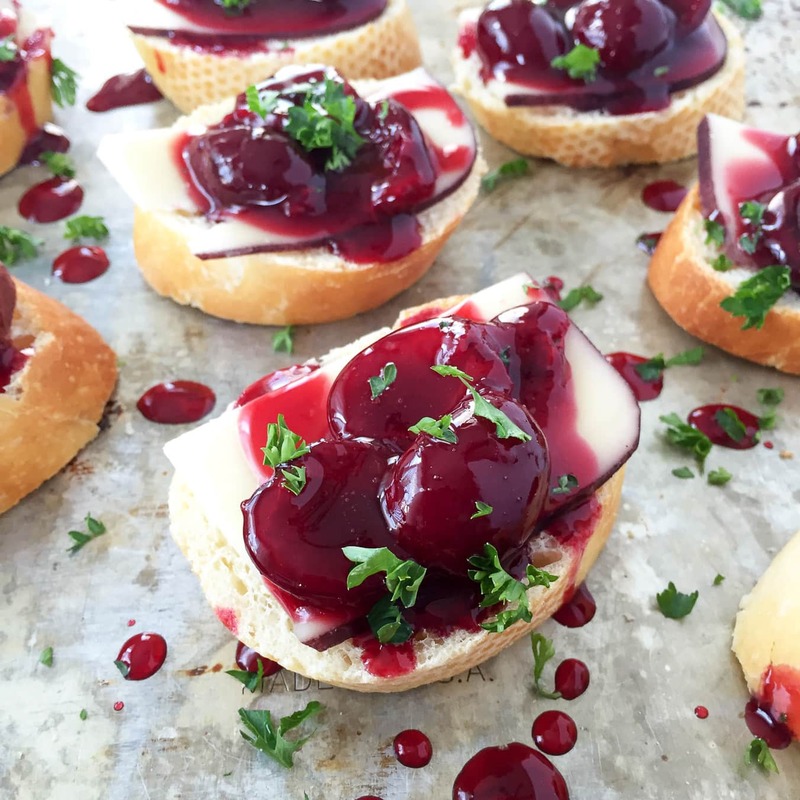 The cherries add such an elegance and richness to the crostini. Such an awesome cheese.